Claudia D shared this with me when I asked about ideas for cooking Salmon. She said she puts butter, house seasoning and lemon together and grills or bakes it. Combine equal parts sea salt, onion powder, garlic powder and pepper. (I am going to use 1/2 the pepper next time). I put it in a jar, put the lid on it and shake it up. 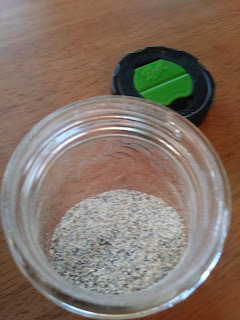 This jar is working much better than a salt shaker did - the mixture kept getting moist from the humidity.